Inkable’s A2 Posters are exactly what you need if you are looking to deliver a big message with a more comprehensive scope of information. More than a simple A2 poster, these are bonzer awareness-building and interest-boosting investments that are easy to produce on a reasonable budget. A2 provides twice the space that our A3 posters have, and has twice the muscle-flexing communication power perfect for large SLOGANS, important ANNOUNCEMENTS, event DISPLAYS, restaurant MENUS, among many other applications. A2 is the largest of our online offerings but please contact us if you are looking for larger sizes. In addition to the offset posters here we also offer a full range digitally printed short run posters. Please contact us for details. Coated stock with a bright and lustrous finish to enhance vibrancy of printed colours. Coated semi-gloss stock with a smooth and slightly silky finish to achieve polished colours. Coated smooth satin stock, very fine and velvety to the touch, prints soft and muted colours. CUSTOM STOCK/FINISH, OR QUANTITY: These are not available through our online system. Please use our custom order form. We prefer .PDF files, but we can certainly work with .TIFF, .EPS, .PSD, and .AI files as well. 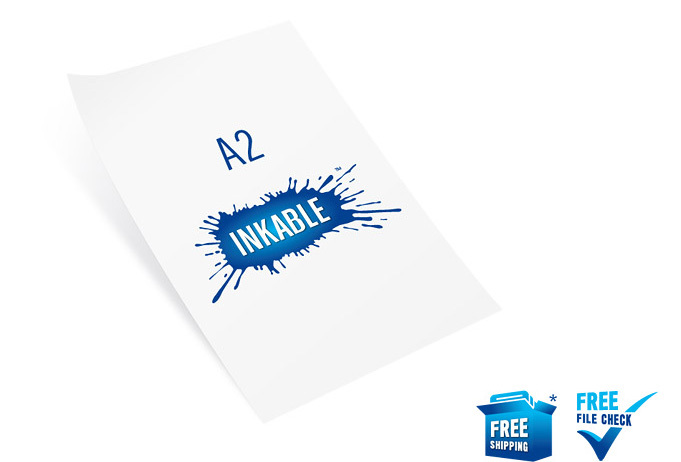 To make things easier for you, please click on the free, quick download of our Inkable A2 Poster template below. Upload your file/s online via our online system’s “Add Files” feature above. Alternatively, you can email your file/s to service@inkable.com.au once you have confirmed your order after signing up. TIP: Make Inkable A2 Posters more hardworking by adding QR codes or call-to-action statements that link your posters to your website. You can also funnel interested people to your email inbox to capture prospects and switch from general to direct marketing.